In the 90s, it became popular to replace the letter ‘s’ with the letter ‘z’ at every possible opportunity. At the time, this was something that was traditionally only done at the end of the world, but some two decades later, there is a casino site that is changing the game by making the switch in the middle of a word. Okay, so Rizk Casino is a bit of a silly name, but there’s nothing wrong with being a bit silly sometimes, and it does mean you will tend to remember the name of this particular online casino, and when you consider how many there are out there, that’s a useful bit of brand recognition. Rizk Casino does something that annoys me, and I feel I am not alone. The tagline to this site is “Best Online Casino Bonuses and Rewards”, partly because others offer higher bonuses, but mainly because the concept of ‘best’ is entirely subjective, it depends on what you are looking for as to whether the bonuses on here are the best. Don’t get me wrong, there’s some good promotions here, but whether or not they are the best is down to each individual player to decide. Rizk Casino is designed to capitalise the popularity of two things, superheroes, and all things vintage, and to that end, the red and yellow colour scheme and general design here are reminiscent of an old-school comic book. Many sites choose to focus on one specific thing on their homepage, some use thumbnails of popular games, others provide information on the site or its promotions, whereas others opt for photos of smiling people in various casino based situations, Rizk casino has a solid go at doing them all. The homepage is split into various sections, which does mean that there are limited games available through one-click access, but also means that you are able to find everything that you could be looking for on the homepage itself. This decision is aided greatly by how effective the navigation is at Rizk Casino, so even if the game you want isn’t there in the thumbnails, there’s various ways that you can find it with ease. This is a fun looking site, and that’s one of the most important factors for enticing new players. Bringing people in is one thing, but to keep them there, you need a veritable smorgasbord of games and gaming types on offer. With software developers including 1X2gaming, BetSoft, ELK Studios, Microgaming, NetEnt, NextGen Gaming, NYX Gaming, Play'n GO, Quickspin, Thunderkick, and Williams Interactive providing the titles here, you certainly get variety in terms of the games that are on offer. There are video slots from the brand new to the old favourites in abundance here. You’ll also find table and card games, including various video poker games, to ensure that you get a lot of options in terms of gaming types as well. If you’re into that true to life experience, the live casino at Rizk is one of the best around, so you will enjoy it here. 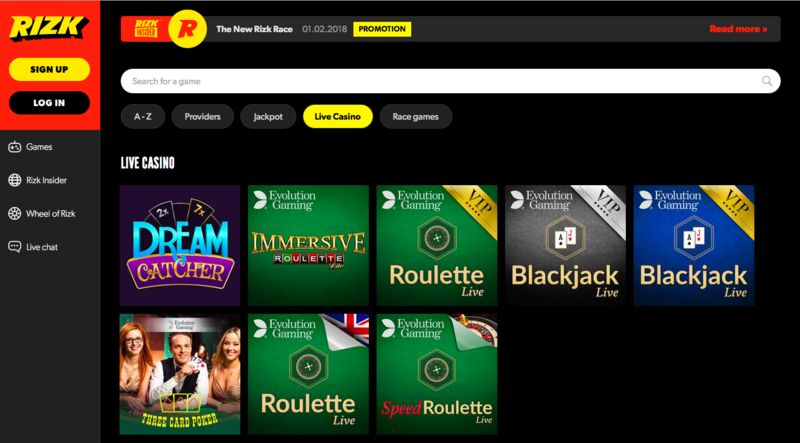 Sometimes, it is not necessary to have a speciality, and Rizk Casino doesn’t really (although the Wheel of Rizk is a great promotion and is probably the reason for the audacious claim of superiority), but what this site does is do everything really well, so whatever it is that you’re looking for, you won’t only find it here, you can also rest assured that it’ll be good.